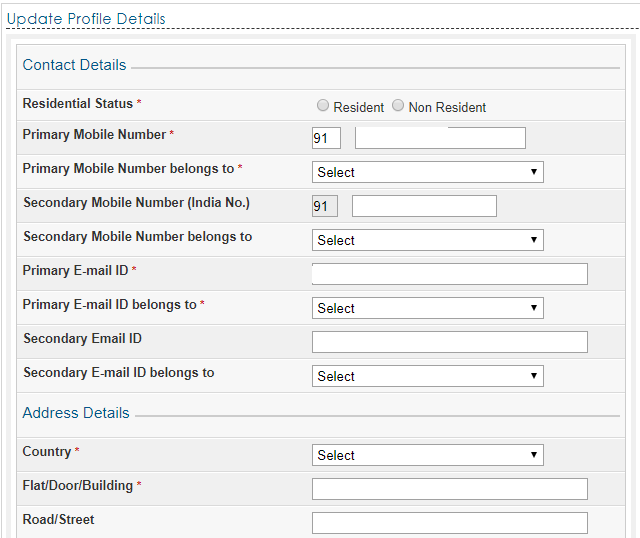 How to update profile on Income Tax Site? Home » Incometax » How to update profile on Income Tax Site? It is essential to update address, mobile number and email address by taxpayers on Income tax e-filing web site. On login Income tax e-filing portal you will be asked to submit address, mobile number, and email address as profile update. This is to ensure that any information or notice raised by income tax department reaches to you in a timely manner. Whenever you are changing your mobile number or email address you need to update the same in Income tax website to get information at right time. Here is step by step guide to update profile on Income Tax site. Visit Income tax e-filing portal. Click on the Login button and log in using your User ID and Password. If your profile details are not updated system will automatically prompt you to update the profile details. You need to provide Residential status, primary mobile number, primary email address and address details. Along with that, you can also provide a secondary mobile number and email ID. You also need to mention that mobile number and email id belongs to whom. For more information look at the following image. Once you update the information click on Continue button. The system will automatically generate OTP. One will be sent to your email address and second to your mobile number. If you do not receive OTP you can click on Resend OTP. Both these OTP’s are different. You need to enter both OTP in respective filed and click on Validate button. On successful validation, your profile information will get updated. The system will display success message on screen. You will also receive an email with confirmation detail by income tax department. If your profile is already updated system will not prompt anything on login. In that case, you can Go to Profile Setting and select My Profile tab and see your profile details. Apart from profile detail, you can also see Aadhaar detail and PAN details in My Profile section. Why you should update your income tax profile with correct information? It is extremely important to update your profile with latest details. This information will be used for sending important communication like refund notice, income tax acknowledgment, tax demand notice and password reset request. The Same mobile number and E-mail ID can be used for a maximum of 3 assesses, as their primary contact details. Primary contact details are mandatory and secondary contact details are optional. « Cash Deposit Machine Locator – How to find CDM Near You?